Provide comfort for the family of Betty Robinson with a meaningful gesture of sympathy. Viewing will be 4PM-8PM Wednesday & Thursday. A service to celebrate Betty’s life will be held at 10:00 AM, Friday, February 15, 2019 at Vondel Smith South Colonial Chapel with interment following at Resthaven Memory Gardens. Betty Jean Robinson, 87, of OKC, passed away February 10, 2019 at home surrounded by her family. She was born August 6, 1931 to Robert and Jane Pate in Byars, Oklahoma. 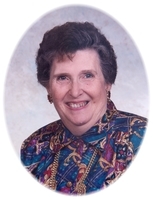 Betty was a member of Crossroads Church for 45 years and traveled with the Goldenaires church group. She enjoyed reading, working in her garden and she loved to make crafts. Betty was preceded in death by her parents; husband, J.E. Robinson; brother, Charles Pate. She is survived by her sons, James Jay Robinson, Darrell Robinson and wife, Shelia; daughters, Sandra Bales and husband, Chris, Carol Simpson and husband, Alan; grandchildren, Kevin Kelley and wife, Shanna, Matthew Robinson, Kyle Robinson, Christina Black, Richard Bales, Mike Robinson and wife Tasha; 8 great grandchildren; 3 great great grandchildren; and many nieces and nephews. To send flowers in memory of Betty Jean Robinson (Pate), please visit our Heartfelt Sympathies Store. Provide comfort for the family of Betty Jean Robinson (Pate) by sending flowers. I am so sorry for the family’s loss. Death is one of the hardest trials to cope with. May you find comfort from the future promise recorded in Isaiah 25:8 which says “he [God] will swallow up death forever.” We have assurance from God’s word the Bible and we can be certain God will fulfill the words from his word. My sincere sympathy to the family for the loss of your dear loved one. May you find peace and comfort in Psalms 65:2. Again my deepest sympathy.